There are certain memories in life that become permanently etched on one’s mind. One of mine is sitting in a dilapidated cyberpunk duplex in the late 1980s, affectionately known as “The Accelerated House” on account of the band that mostly lived there (the stray cat that moved in was named “Velocity”). Fossicking around a resident’s music collection I discovered an EP of a track called Nostalgia by a band named The Chameleons. As my eyes and ears awakened, I mummered to myself “This is truly rocking”. Shortly afterwards I found the “Script of the Bridge” LP in the same collection which cemented the initial response. It was the beginning of the end. In subsequent decades I became “a bit” of a fan and advocate of this relatively unknown group which still, after all these years, requires some introduction for the uninitiated. One could describe them in post-punk terms; if you could imagine a cross between Joy Division, The Comsat Angels, and The Psychedelic Furs you are sort of in the ballpark. A great combination of powerful bass and drum, powerful and competitive alternating lead and rhythm guitars, The Chameleons could produce sounds that could be range from ethereal and otherworldly and readily then switch to angry, fast, and punk-inspired. Perhaps their greatest secret was an ability to combine thoroughly uplifting and inspiring music with maudlin and utterly terrifying lyrical content, evoking both rapture and misery, and often in the same song. Yes, they are that good. Sadly however, it seemed the discovery was all too late. The band was initially active only from 1981 to 1987, leaving the initial three albums, Script of the Bridge (1983), What Does Anything Mean? Basically (1985), and Strange Times (1986), in their wake. There was a brief return from 2000-2003, saw the release of new material with Why Call It Anything (2001) an album less-well received. Alas, there was still no journeys to these far and strange antipodean lands. 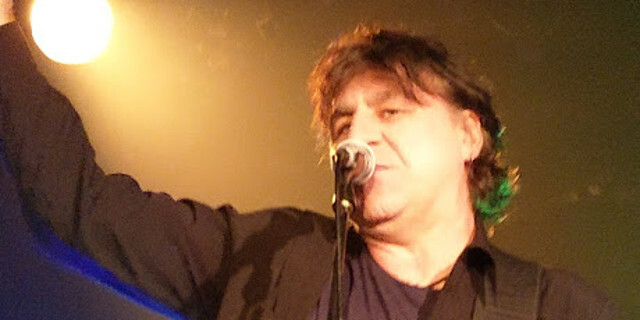 Thus one can thus imagine the pleasant surprise to discover that The Chameleons were actually playing in Australia in 2018, albeit consisting of lead singer Mark Burgess and members of the most recent successor band ChameleonsVox, perhaps satisfying the recently departed Mark E. Smith law of bands (“If it’s me and yer granny on bongos, it’s The Fall”). The first concern was who the hell would turn up? Happily, it was a good-sized crowd on the night with a surprising and pleasingly diverse audience, ranging from young post-punk revivalists who were born around the start of this century to those elder folk who had been there from the original days, now more than thirty-five years in the past. The main support band, Panic Syndrome, proved to the be a very good choice with variant sounds and some that were very reminiscent of The Cure, and clearly a diverse personality range, from the comic relief of one guitarist, to the “Silent Bob” of the bassist, and a dominant front-man as lead. It was also quite evident that they had a small contingent of local fans who were enjoying the visit of the interstate guests. 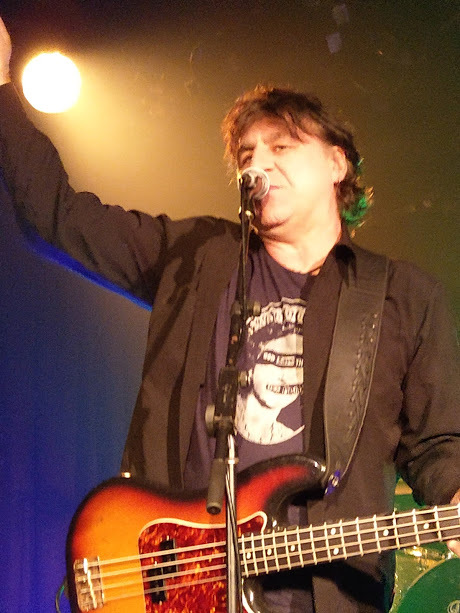 The Chameleons however were the main show, and they started powerfully with their famous opening track from Script of the Bridge, “Don’t Fall”. One may have had concerns with the mixing and sound, as The Chameleons were very much a band where instrumental clarity and difference are important. Another question that could be raised is whether the non-original members would be up for the complexity and melody demanded? Such fears were quickly dispelled. The sound was crystal-clear (albeit without some of the studio effects), performed with great acumen, and remained so throughout the night, much to the delight of the fans – one dickhead was even waving around a pair of toy chameleons courtesy of SuSE Linux (oh wait, that was your reviewer). The set itself set was a selection of material from their earlier first three albums. As is to their style, songs like were interspersed in the style with slower paranoid tunes like Monkeyland juxtaposed with the astounding Looking Inwardly which simply thundered along. This did mean, of course, that those wanting a mainly hard-and-fast delivery would miss out on a couple of favourites, but at least tracks like Second Skin and Singing Rule Britannia were given prominence, the former in particular eliciting a thoroughly positive response from the assembled. Some of the tracks were given far more elaborate versions from their studio recordings with unexpected but appropriate inclusions: the already lengthy Soul in Isolation, for example, was deliciously combined with The Beatles’ Eleanor Rigby. The thirteen-track set was concluded with the classic View From A Hill. Of course, one could have wished for more, indeed, a lot more, but that would border of cruelty: “Please sir, could you play your entire catalogue? And again? Adoring fans still want to hear more”. For a necessary encore their most well-known track Swamp Thing was first up. It has always seemed to be a carefully constructed song, still well within The Chameleons’ post-punk aesthetic, but also designed for commercial airplay, and it has certainly served as a gateway drug for the rest of the band’s catalogue. The final track of the night however was Nostalgia, a somewhat surprising choice given that Mark Burgess has acknowledged in the past his difficulties of performing this, but of course a truly welcome one. The evening was one that was truly satisfying and hopefully an opportunity to further spread the good sounds of The Chameleons.